It's worse than we ever thought it could be, and after 30-plus hours and a stream of increasingly frustrating bugs we're calling it quits. Here at PCWorld I try to stick to a simple standard when reviewing games. I either finish the game or the game finishes me—a.k.a. after long hours spent frustrated I deem it unplayable. 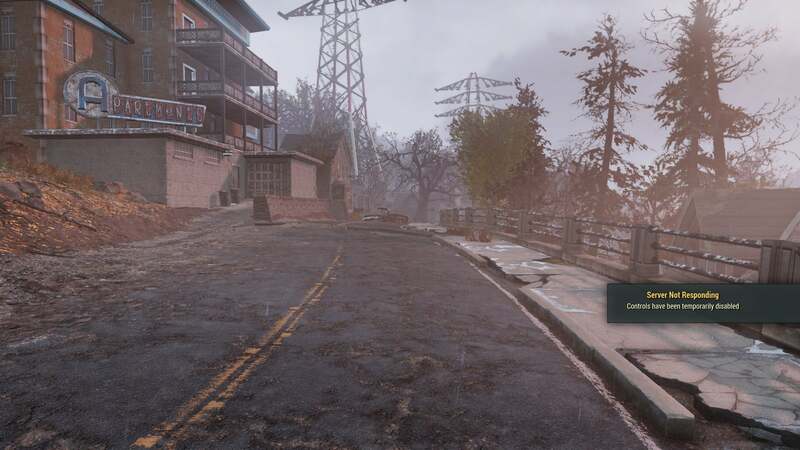 Fallout 76 is not strictly unplayable, but after 30-odd hours wasted in this West Virginia wasteland I’m calling it. Time of death, around 2 a.m. on November 19 when I logged in to find half my quest log mysteriously wiped away, as if I’d never started any of a half-dozen different missions. It was the latest motivation-sapping bug in a long, long cavalcade, and so I’m tapping out. Fallout 76 wouldn’t be a great game even if it functioned properly. And in its release state? It’s worse. Let’s just recount the bugs, shall we? It started with the Bureau of Tourism, a mission you pick up mere hours into the game—and, if you were one of the many unlucky players, a mission you could never finish. An item you needed to interact with wouldn’t allow interaction, causing the quest to break entirely. Bethesda fixed that quest with this week’s patch, so it feels unfair to harp on it too much. On the other hand it was a quest people noticed was broken in the beta, because as I said it pops up maybe four or five hours into the game. When I finally encountered it, there were multiple Reddit threads discussing the problem. It took Bethesda nearly a month to fix. And it’s not even the only busted quest! Another early one, “Personal Matters,” concludes with you having to kill a specific enemy inside a specific basement. I entered the basement—and the enemy was already dead. Yes, we’ve traveled back to the days of EverQuest and early World of Warcraft, queueing up to complete quest steps. I logged out, then logged back in to a new server. Dead. I came back the next day. Dead. I came back the next day. Dead. 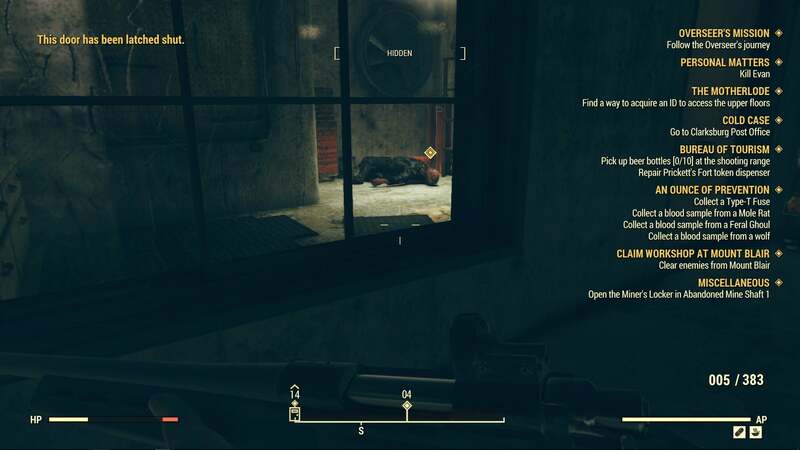 Finally, after logging out to eat dinner and then returning, I was lucky enough to find a server where this damn ghoul was alive, pop a .308 round into his head through a window, and finish the quest. It took me three real-world days to finish a quest that should’ve taken three minutes. Playing the beta a few weeks ago, I already complained about Bethesda’s slavish adherence to real-world logic over video game logic. If someone is using a crafting station, you can’t use it until they’re done. Why? I guess because you need to watch your character sit down and stir a pot, or smack a hammer into a bench over and over while you peruse menus. Same goes for merchants. Someone else is trading with the only robot merchant in town? You’d better hope they don’t take too long, because you’re stuck waiting in line. The lack of instancing in quests is beyond the pale though. Hell, even The Division—a game that somehow launched in a state where players could stand in doorways and block others from getting out—understood that the campaign should be unaffected by other people’s shenanigans. Safely sandboxed in your own unique instance, you could take in the story (or what passed for a story in The Division) in peace. Not here! Since there’s little-to-no instancing, Bethesda also treats every environment as a live-fire range at all times. What if some other player enters the building? There needs to be enemies for them to fight, right? And so what happens is you’ll be deep in some desolate ruin, trawling for trash, when suddenly all 20 or 30 enemies you meticulously killed will just respawn and start attacking you again. I’ve had it happen as soon as five minutes after ceasing combat, digging through a desk drawer and then plunged back into a prolonged battle for my life. Not that there’s much reason to explore anyway. Quests? Almost all boring. There are no human NPCs in Fallout 76. Bethesda made that clear repeatedly before release. I still thought that left the door open for ghoul NPCs though, but nope! Not from what I’ve seen. And even robots aren’t really NPCs as much as quest dispensers. They don’t talk with you, they talk at you. There’s no dialogue system in the game whatsoever, and so no real opportunity for roleplaying. You either finish a mission or you don’t. Even Elder Scrolls Online, a stripped-to-the-bone version of an Elder Scrolls game, at least presents itself as an RPG with basic dialogue trees and other trappings of the series. Fallout 76 dispenses with any pretense. And stripped of that pretense, most of Fallout 76’s quests fall flat. It’s a lot of “Find This Item” or “Kill This Enemy” without any of the motivation that usually stems from a well-written adventure. You’re not trying to rescue Nick Valentine to get a lead on your son, or accelerate the growth of a tree-man to reforest the Capitol Wasteland. 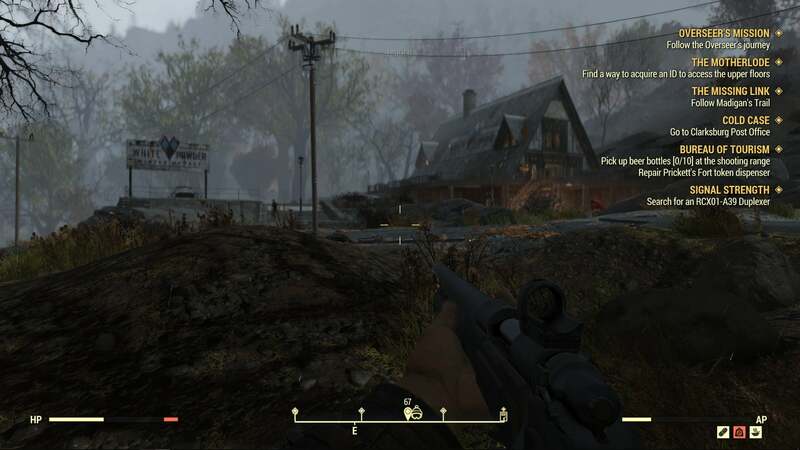 In Fallout 76 you’re just chasing ghosts, and finding them only leads to more ghosts. Post-nuclear West Virginia is filled with terminals to read and holotapes to collect, but none of it feels important or even particularly interesting. They’re well-written, and the holotapes well-acted, but it’s no substitute for an actual conversation. 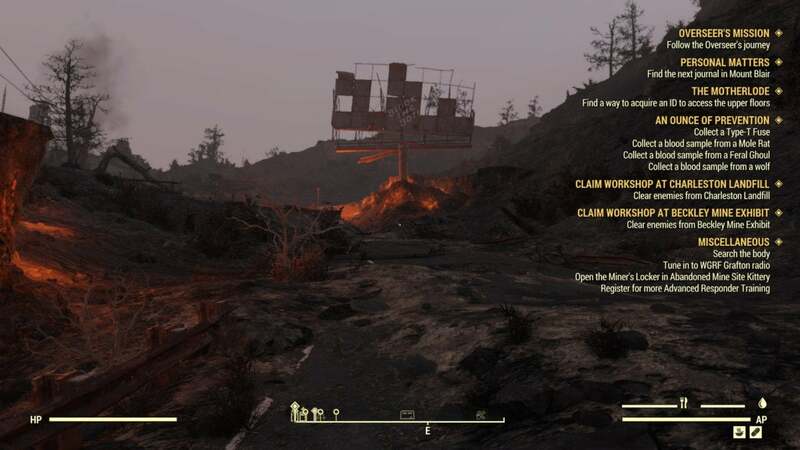 The saving grace is Fallout’s knack for environmental storytelling, but even here the game falters. A few locations are top-tier Fallout, including an abandoned water park, a state capitol decked out for Christmas, the Mothman Museum, and a recreation of the Green Bank Telescope. A lot of it is generic though, retreads of Nuka Cola factories or Mama Dolce’s or whatever. Previous Fallouts had these sorts of areas as well, but they provided a counterpoint to the present-day. You were delving into the past to help build a better future. Fallout 76 is all past. There is no future, and there is nothing to work towards except your own survival. To that end, most of your time in Fallout 76 is spent collecting garbage. Ostensibly the goal is to craft a base, similar to Fallout 4’s settlements. 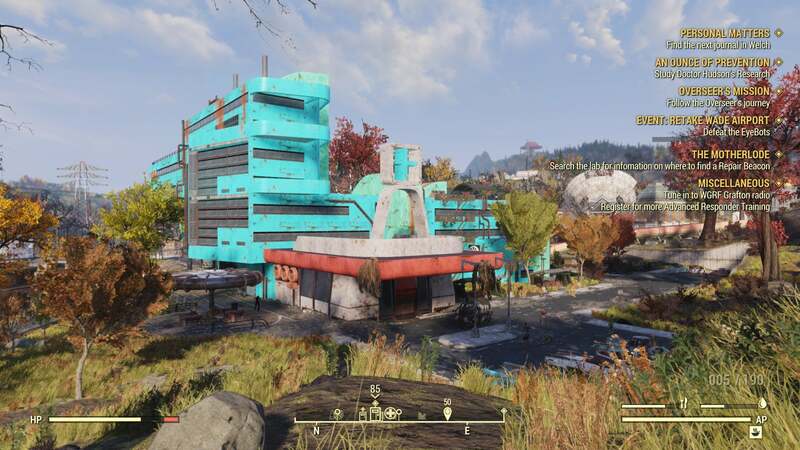 This time you can build pretty much anywhere, courtesy of your C.A.M.P. or Construction and Assembly Mobile Platform. You can even move your base to a new area if you find a particularly scenic overlook. But...why? Those who were into Fallout 4’s base-building might get a kick out of this. I find it extremely tedious, especially because the interface is clumsy as ever on PC. WASD to move, Z and X to change categories, the arrow keys to change items, and then the mouse to rotate and place an item? Yeah, very intuitive. Unlocking items to build is also very slow. After 30-plus hours I’ve unlocked maybe a fifth of the possible items, none of them very fun or interesting. And none of it has a functional purpose beyond the various crafting benches and the player’s stash. For a long time I moved my base every 10 or 15 minutes, placed a crafting table and the stash, and then unloaded my accumulated junk. That’s another aspect that’s annoying: If you move your base, you have to rebuild it. Bethesda allows you to “Blueprint” your design and place it in one big chunk, but I’ve had times where the blueprint couldn’t be built in the space I’d chosen—and thus none of my crafting tables were accessible. Finally I just created duplicate tables to work around it. At this point I’m mostly building stuff to clear room in my stash though. The limit on your stash is comically low, at 400 in-game pounds. Those who’ve played any of Bethesda’s Fallout games know you can fill that in about an hour, and it doesn’t stretch far. At this point I have a suit of power armor, two weapons, a handful of stimpaks, some bobbleheads, and a bunch of crafting junk in my stash. That’s it. I’ve taken to throwing out Fusion Cores and Missiles and other valuable-but-heavy items just to make more room, and I reckon at this point I spend about a quarter of my time with Fallout 76 in menus, trying to dump weight. But if the loot harvest is bad, the lack is even worse. I grumbled for the first half of the game about collecting junk, vacuuming up Abrexo Cleaner and Lead Pipes and Alarm Clocks and other miscellanea to break down into crafting components. Then I maxed out my stash, and realized that aside from collecting junk...there’s not much to do in this world. Just the missions, and those are (as we’ve covered) not very enticing either. With no impetus to explore, no especially unique or important items to find, there’s even less reason to enter the various generic buildings dotting the landscape. You go straight to the mission objective, grab the holotape or read the terminal, then leave—over and over again. And, of course, hope somebody else didn’t already break the quest in the process. Bugs. Let’s get back to talking about bugs. I’ve had at least four or five server disconnects, each time losing a bunch of progress when I logged back in and found myself half a mile from where I’d been dropped. I had one quest reset itself to an earlier stage when I logged out, losing half an hour of work. I never went back to finish it. I logged in once to find myself trapped inside someone else’s base, all the exits requiring a picklock skill higher than mine—meaning I was just trapped forever, or until I logged out and connected to a different server. Another time, a wolf spawned underground. It could attack me, but I couldn’t attack it, so I died. One time I picked up a comic book and the texture file was apparently just missing. Performance is abysmal, but inconsistently so. Sometimes you’ll be humming along at a smooth 60 frames per second, and then with no warning you’re battling sub-30 frame rates, your weapon swinging wildly back and forth as you try to draw a bead on encroaching ghouls. I haven’t had this many “I swear I shot you!” moments in over a decade, some of my bullets passing through enemies with, I have to assume, the magic of bad netcode. A thick Vaseline-like smear makes everything more than 100 feet away blurry, but object pop-in is still pervasive. And my personal favorite is enemy pop-in, where a hallway looks deserted until suddenly three baddies appear out of thin air. These encounters are especially frustrating because Fallout 76’s combat is terrible. I mean, all modern Fallouts have had mediocre gun-play, but in the past they got around this with V.A.T.S., the pseudo-turn-based targeting system that slowed action to a crawl and let you pop off a bunch of targeted shots. 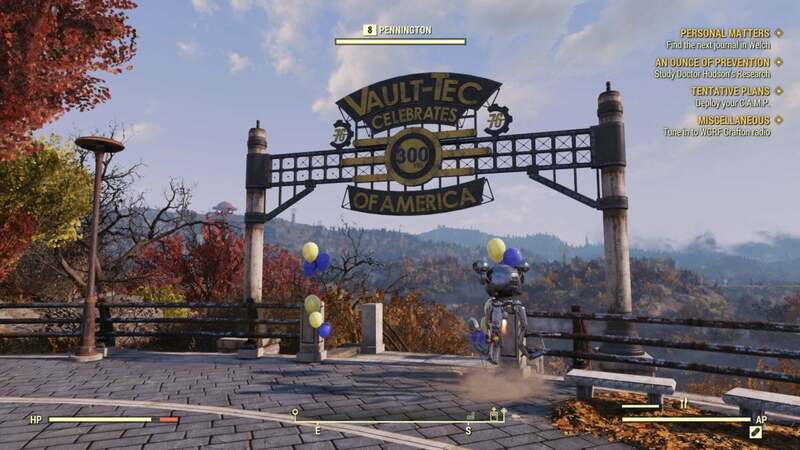 Fallout 76, being an online game, can’t be paused or slowed down, so instead V.A.T.S. is a glorified auto-aim with a percentage-to-hit modifier that fluctuates up and down wildly. On PC it’s far easier to just take out a shotgun and blast everything. No pausing also means all menu navigation is done live, which is even more frustrating. Have fun trying to equip grenades while simultaneously being shot at. And then there’s the leveling system. Fallout 76 ditches the traditional point-allocation system for some sort of card-based perk layout. More than 30 hours in, I still haven’t figured out how the hell it works, nor has anyone I’ve talked to. I think each card you buy gives you a corresponding skill point, except sometimes that’s not true? Or at least sometimes I’ve bought a card and then found out I can’t use it. So yeah, add “Unintuitive Leveling System” to the list of complaints. I need to wrap this up, even though there’s so much more I could talk about. Some of it I talked about in the beta, like voice chat being always-on and automatically opted in, so you’re stuck listening to people ramble about “My controller batteries just died!” over top of holotapes and other key story beats. Other parts are just annoying quality-of-life issues, like friend requests not being friend requests—you have to add each other individually, or else every “friendship” is one-sided. I could talk about the complete lack of reason for player interaction, which raises the question why Fallout 76 is a multiplayer game to begin with. But let’s cut it off here, and close this chapter. 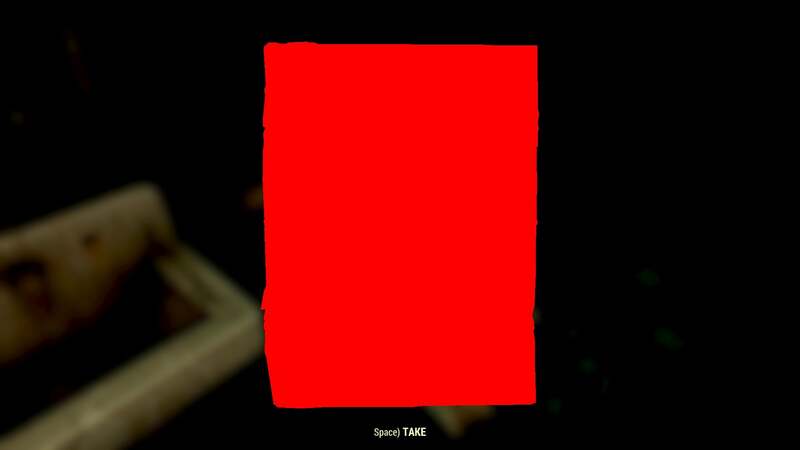 I’m done with Fallout 76. Maybe like Elder Scrolls Online, Bethesda can tease a decent game out of this foundation in a year or two. Doing so will require hard discussions about what Fallout 76 wants to be though, and what players want out of a multiplayer Fallout game, because I don’t think it’s this. We’ll see whether Bethesda can make the pivot. 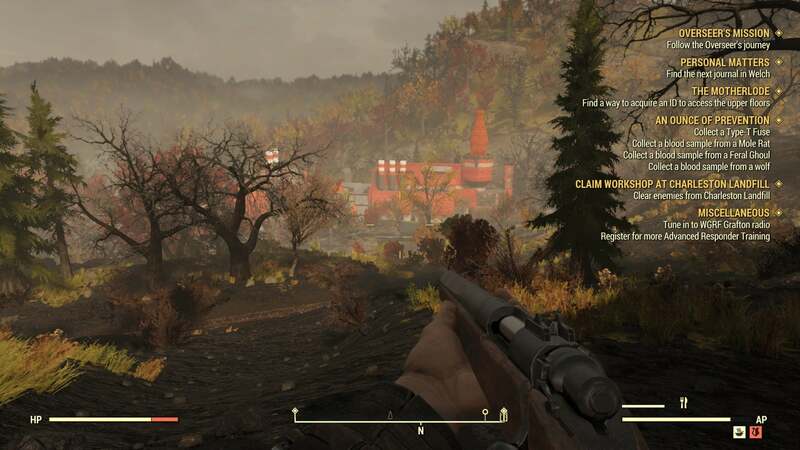 Fallout 76 looks and feels like a Fallout game, but its dead world, boring quests, and constant stream of performance issues make this multiplayer outing radioactive.